One of the biggest joys of motorhoming around Australia in our beloved Talvor Murana is the constantly changing scenery. After the excitement and adrenalin of the Mount Isa Rodeo, you couldn’t ask for a more pleasant setting to relax and play cards than at the freedom camp in Camooweal. Next to a tranquil billabong we captured photos of elegant black swans gliding along and then looking less elegant as they duck dived, bottoms up, for their supper. Attending the Camooweal Drover’s Camp the next morning was quite an enlightening experience and really deepened our understanding and appreciation of what testing rigours drovers endured for months on end, just to put meat on tables around the country. Barkly Homestead the next night had a welcoming atmosphere and the barman happily gave us some crushed ice so I could make camping ice-cream, eagerly relished by our little group. One of our travelling companions had some other friends joining her for part of her journey and we met up with them at the Tennant Creek art gallery (definitely worth a look) before camping with them at Devils’ Marbles. We were very proud of ourselves climbing to the very top of the tallest rock formation and we all enjoyed the colours of the rocks at sunset and again at sunrise. Thirty kilometres out of Tenant Creek, past the alien sculptures at Wycliffe Well, we had the pleasure of purchasing a piece of Aboriginal art right on site at the Ali Curung artist community. We were thrilled to meet the artist and she even wrote out the story of the painting for us. It was pleasing to know that the money goes directly to the painter and the community and we were delighted to find the colours in our painting blended just perfectly with the lovely furnishings in our RV. Faye and her friends then continued down that road to Alice Springs while George and I turned and headed to Banka Banka Station. This camp is worth a mention, firstly for its wonderful communal fire pit and for the interesting items available for purchase from the bar, namely Grey Nomad wine. The bottle features a fascinating ode to Grey Nomads. While visiting we noticed a few young couples packing up their tents ready to add them to the already huge packs they were carrying. We felt very appreciative of our comfortable home on wheels whilst these youngsters were touring huge expanses of outback country, on bicycles! The Daly Waters Pub was fascinating and the entertainment most enjoyable. I chuckled at the many poorly spelt (deliberately I hope) signs, which added to the fun. Mataranka Homestead was our next stop and we felt in heaven swimming in the clear, very warm (32°) springs. A replica of the Elsey Homestead, made for the movie We of the Never Never, stands here complete with elaborate costumes on display, and they play the movie theme song at the bar/restaurant daily at noon. Nearby, Bitter Springs provided another heavenly experience as we floated down the crystal clear, warm river under a canopy of fan palms. You need to take your thongs with you as you float because the walk back is quite uncomfortable on bare feet. I loved the Cutta Cutta Caves with the formations of the dry Karst limestone being quite different to that found in wet caves. The name apparently means ‘sparkling’. I’m not sure which I love and appreciate most, caves or hot springs, but either way our next stop could not be any other than at Katherine Springs where access to these delightful pools is directly from the caravan park (Riverview), a similar situation to that at Mataranka Homestead. These Springs are cooler but if you position yourself well, you can enjoy a massage by backing up to the short waterfall; bliss. 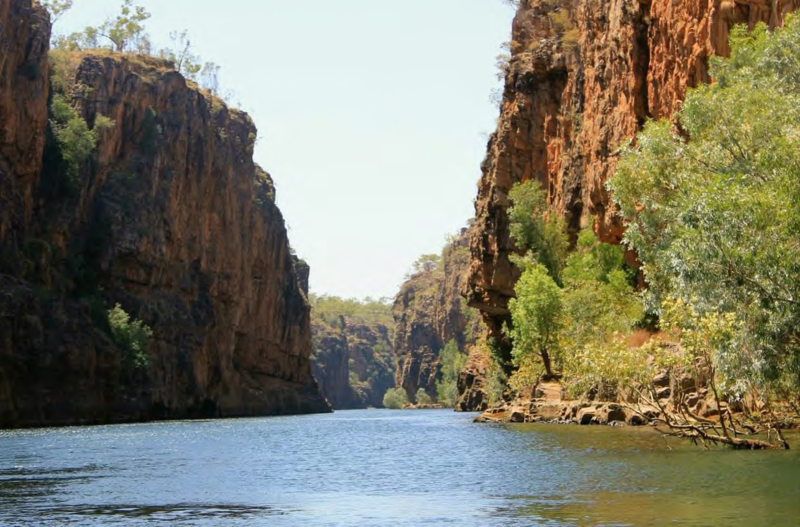 It is probably a ‘given’ that you take a cruise through Katherine Gorge while there. This was two hours very pleasantly spent cruising to admire the rock cliffs, interspersed with short walks through a series of gorges. Our informative guide pointed out Jedda’s Rock, the imposing cliff face from which Jedda hurtled to her death in the movie of that name. George gingerly nursed the RV through seven kilometres of gravel to reach Douglas Hot Springs where we lolled about in the shallow water. You can mould your body into the warm, wet sand and just appreciate the warm water lapping over you. 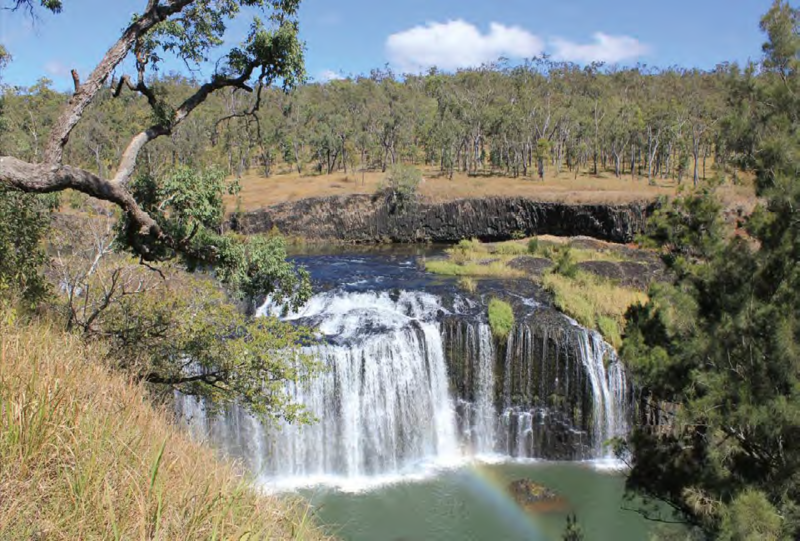 Although this is a special site for the traditional Aboriginal owners, visitors are welcomed. You are even invited to put water from the Springs on your head for good health. That evening, the Adelaide River Show Society (ARSS) provided great camping facilities with a pool, dinner available and Grey Nomad champagne on special. As every day is worth celebrating, we thought the champagne a great idea. A sobering contrast was the Adelaide River War Cemetery where we couldn’t help feeling a quiet and respectful gratitude. 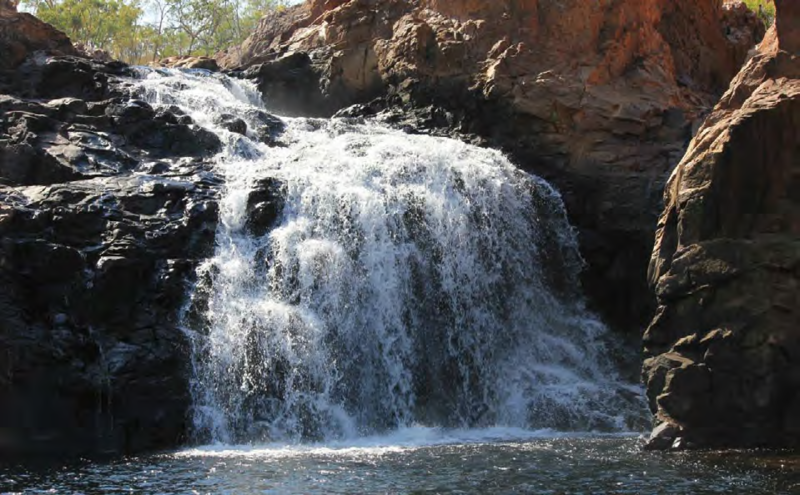 Litchfield National Park had impressive camping facilities and amenities. Wangi Falls was beautiful but we didn’t know if we could brave the cold waters of the plunge pool beneath the Falls. I believe that every year you get older, cold water gets colder. However, after completing the walk and steep climb around the Falls, we welcomed the opportunity of cooling off in the clear waters, in spite of a croc sighting, (a small, non- threatening ‘freshie’). When we saw it slide from its sunning log, slipping into the water to join us, we decided we’d had enough of a swim. The Shady Creek Walk to Florence Falls wound its way through cool and pretty monsoonal vegetation, after which we reluctantly left Litchfield, but not before sighting our first, tiny rock wallaby. So cute! Next stop was Berry Springs, where small fish nibble any loose skin on your feet; a startling experience at first. Unfortunately we hadn’t taken the camera down to the water so we missed capturing the archer fish shooting up their spurts of water like water pistols. It’s not very far to Darwin from Berry Springs, and so we kissed our RV goodbye for the evening and joined a bus tour into Mindil Markets. Wow! Not only was there a huge array of tempting delicacies at the many international food stalls, plus a great selection of fascinating items for sale, but entertainment also abounded and of course there was the famous Mindil Beach sunset to be experienced. Hundreds of people flocked to the beach from the Market, which backs directly onto the seaside. Some had even taken their chairs and tables down onto the sand, ready to toast the sunset with champagne flutes in hand. 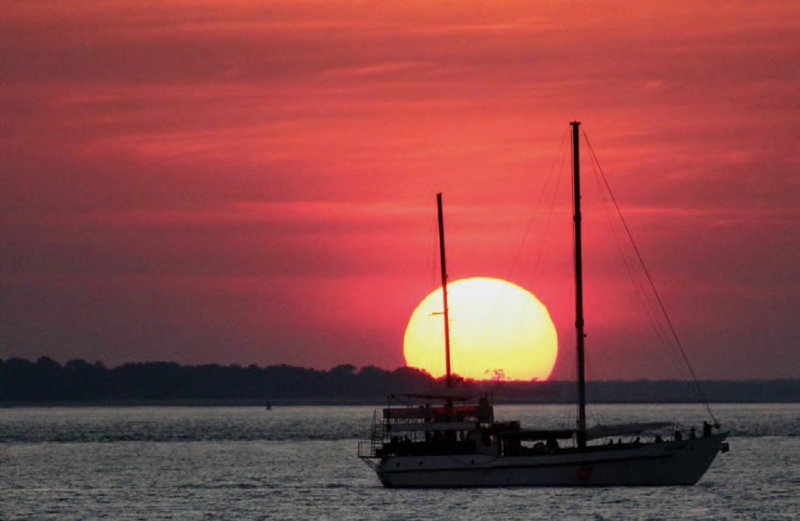 There was a feeling of reverence as the sun threw out its final colours for that day and, as the great orb’s fire was (seemingly) extinguished by its dip into the sea, the crowd clapped in salutation. It was quite moving but the stillness didn’t last long as people returned to the Markets for the escalation of busking entertainment. Fire twirling and dancing, whip cracking to music and pan flutes vied for your attention; but it was the deep, guttural sounds of eMDee which drew the largest crowd. This set of four didgeridoos strung together as one instrument, plus drum accompaniment, set the young local Aboriginal girls dancing with impressive moves we hadn’t thought possible. They were so shy and would only perform for a few minutes each, and this, only after much encouragement and sometimes having to be gently pushed into the performance space. There were lots of other delights in Darwin, including the aircraft museum, the state art gallery/museum and the wave pool in town. We also enjoyed going to the movies to see The Sapphires to which our current location added extra relevance for us. 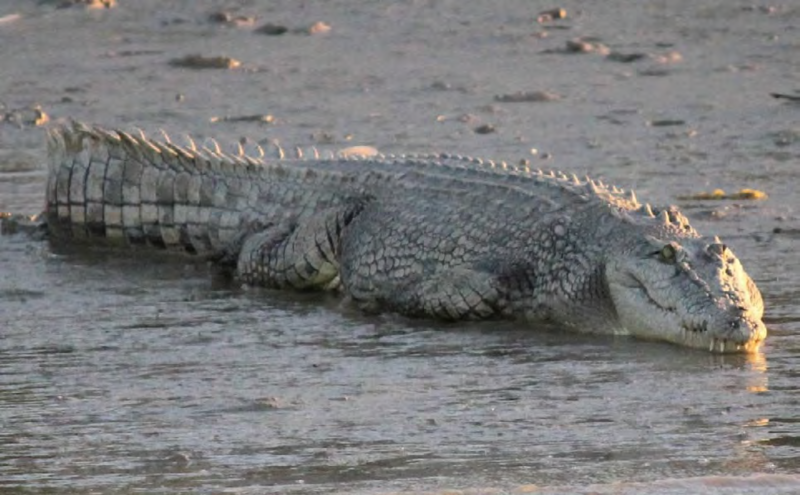 A cruise on Corroboree Billabong, just outside of Kakadu National Park was an enlightening introduction to the area. We saw lots of waterbirds; stunning, large, pink waterlilies; and no less than three sea eagles guarding their lofty nests, plus a parade of ducks sauntering past a large crocodile, as if daring it to lunge. Our tour guide obviously possessed a wealth of knowledge regarding this wild habitat and some of the animals knew him as he demonstrated by drawing up alongside a majestic jabiru, which obligingly allowed close-up photos. The hamlet of Jabiru was where we next camped before moving to Merl camp ground near Ubirr where we were looking forward to seeing ancient Aboriginal rock art. During the dry season, park rangers give enlightening talks on the art, which we really appreciated. One Aboriginal ranger, grandson of Billy Nigie, provided stories and viewpoints of the traditional owners. The tracks to each rock art site were good enough for wheelchair access and made for enjoyable walks around the fascinating rock formations. George had a real ‘wow’ experience upon climbing the high rock face where the sunset scene was filmed for Crocodile Dundee. On reaching the top you are suddenly confronted with the bright green of the flood plain below, dotted here and there with brilliant blue lagoons, marking the places where the Rainbow Serpent had touched the ground back in the Dreamtime. Of course we had to return the next day to see the sun setting, and this meant we had another day to learn more of the Aboriginal customs from the knowledgeable guide. Some ladies from Oenpellie (Arnhem Land) come down to Merl camp ground on Tuesdays to demonstrate a particular Aboriginal weaving technique. This involved stripping Pandanus leaves (extremely difficult), breaking up roots and rocks (also very difficult to break these up), and making dye by boiling them, and then weaving them into a wristband. George enjoys wearing his ‘hippie’ band and I have one too; great mementos. Before leaving Kakadu, we also visited other rock art sites in the Nourlangie region and braved the long, hot trek to Nangulawar which we thought had the most amazing rock art of all. Arriving at the site, we found a large sign warning of dangerous wild buffalo sightings in the area; a bit disconcerting as we were out there on our own. Fortunately no confrontation occurred with any wild beasts. Enjoying a stroll on the boardwalk at Yellow Water represented our farewell to Kakadu and there we did see some wild things. George managed to capture (on camera only) a saltwater crocodile slowly and stealthily sneaking up on an unsuspecting ibis, busily feeding. We left before the inevitable happened. Happy hour talks saw many refer to Kakadu as ‘Kakadon’t’ but we were very glad we checked it out for ourselves. Edith Falls was another great national park experience. The plunge pool at the bottom of the lower Falls was a sensational swimming spot and the steep walk to the upper Falls was certainly worth the effort. Then it was back to Darwin for a few days to welcome our eldest daughter, who was flying in to spend a long weekend with us. How great it was to see her. Next stop: the Wild West!